Really yummy chocolaty cream puffs filled with chocolate whipped cream and topped with chocolate fudge sauce. 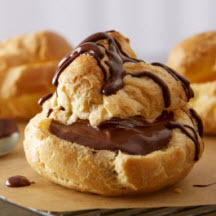 For Cream Puffs: Preheat oven to 400°F (205°C). Line baking pan with parchment paper; lightly spray paper with vegetable oil spray. Combine water, butter and salt in heavy saucepan; cook to boiling, stirring until butter melts. Add flour all at once; stir vigorously over low heat about 1 minute or until mixture leaves side of pan and forms a ball. Remove from heat. Place dough in mixer bowl. Gradually add eggs, beating after each addition until smooth. Pipe or drop by heaping teaspoonfuls, 3-inches apart, on prepared pan. Bake 20 to 25 minutes or until shape is twice its original size and puff is golden brown. Remove from pan to cooling rack. Horizontally slice small portion from top of puffs; set tops aside. Remove and discard soft dough from inside puffs. Cool completely. When cream puffs have cooled, horizontally slice small portion from top of puff; set tops aside. Remove and discard soft dough from inside puffs. For Filling: Beat together whipping cream and HERSHEY'S Chocolate Syrup or HERSHEY'S SPECIAL DARK Syrup until stiff peaks form. Spoon or pipe about 2 tablespoons filling into each puff bottom. Replace tops. Drizzle each filled cream puff with a generous teaspoon of HERSHEY'S CHOCOLATE SHOPPE Fudge Topping. Serve immediately. Refrigerate any leftovers. Recipe and photograph courtesy of HersheysSyrup.com.